For those in publishing Bowker is a well-known name. The company is the exclusive agent for the United States issuing ISBNs (International Standard Book Numbers). The company also maintains the Books in Print database and is a diversified supplier of data, publications, and services to publishers and book distributors. Not surprisingly, Bowker is a valued source of statistics on books. We were reminded of this by a story in the New York Times this morning here (“So Far, E-Books Aren’t Making Sales Waves”) citing Bowker as its source. 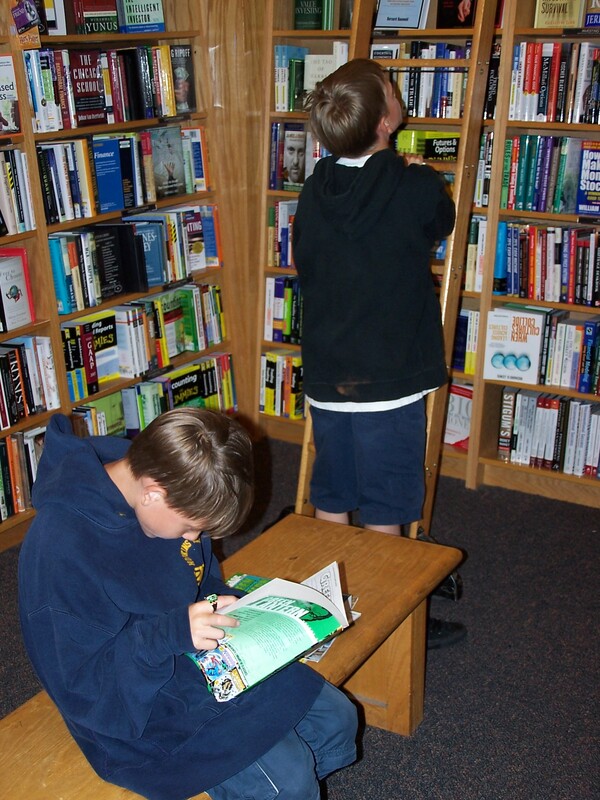 The thrust of the story is the observation that e-books command just 2 percent of all books sold. Most books still march to market on paper legs (35% as trade paperbacks, 35% as hardcover books, and 21% as mass market paperbacks). Reporting on the channels, Bowker’s figures indicate that large chains (27% of books sold) hold the top position; e-commerce, read Amazon.com and others, come next (20%), and then in sequence book clubs (11%), mass merchandisers (8%), independents (5%), and “other” accounting for a right HUGE 29 percent. Long live Other! Bowker’s site is here. We expect to sprinkle some stats from that source into this blog as time passes to maintain our emerging reputation as a site where you can never tell what you will encounter. Dog shows? Hieronymous Bosch? Astronomy? And, yes, the stats. The absence of children in Hieronymus Bosch’s The Garden of Earthly Delights (Hmmm…) suggested that today we might have some quotes about children—well aware that some of our readers have them, ranging from newborns on up to the terrible teens. Time is the thief you cannot banish. But where in the world did the children vanish. And watch the men at play. If we contemplate literary genres, two very broad and related categories are utopias and dystopias. The etymology here is simple enough. Utopias are “no places,” thus impossible places—because we find it difficult to believe in paradise on earth. Dystopias are “bad places”—and by contrast we kind of believe that dystopias are altogether possible. The best know utopia is Sir Thomas More’s. He coined the word from the Greek roots of no and place: Of the Best State of a Republic, and the New Island of Utopia (1516). Most of the books in this genre are projections of political orders in which a semblance of perfection has been reached, hence Plato’s Republic may be considered a kind of archetype—unless we evoke the poet Hesiod (eighth century B.C.) and his backward projection of a past Golden Age. Just a few modern utopias come to mind, one being Aldous Huxley’s probably least-known work, Island (1962). Two science fiction offerings are Jack Vance’s Big Planet (1957) and Ursula K. Le Guin’s Always Coming Home (1985). Dystopias, by contrast, are many and varied. We would propose George Orwell’s Nineteen Eighty-Four (1949) as the most famous. Interestingly enough—and we infer this from a listing of dystopian works by Wikipedia here—is that as time has advanced so dystopian books have multiplied. In that listing Wikipedia includes one work for the 1910s, two for the 1920s, six for the 1930s (including Huxley’s Brave New World (1932)), eight for the 1940s (including, along with Orwell’s big opus his equally well-known Animal Farm (1945)), eleven in the 1950s (including Ray Bradbury’s Fahrenheit 451 (1953)), fifteen in the 1960s (in which period A Clockwork Orange by Anthony Burgess (1962) ranks high but we especially value John Brunner’s Stand on Zanzibar (1968); it is, for its time, a stunningly prophetic view of this time), twenty-three in the 1970s, twenty-one in the 1980s, thirteen in the 1990s, and thirty-three! in the 2000s. 9/11 no doubt made its contribution in that last decade. In the mid-twentieth century, as earlier in the works of Jules Verne, science fiction presented a kind of limited utopian vision of technology. Later in the century, and these days still, technology in its cybernetic aspects has produced an ever darker vision—perhaps also mirroring the times. Balanced visions of the future, such as we claim are presented in the Ghulf Genes cycle (see Books tab above) are the rarity. Michelle D-P, one of ours, trying to make sense of this blog’s thematics a while back, labeled the first post on actual dwarf planets as Nerd’s Corner. So let us hide away another object in that corner—and it is a dark and very distant corner indeed. 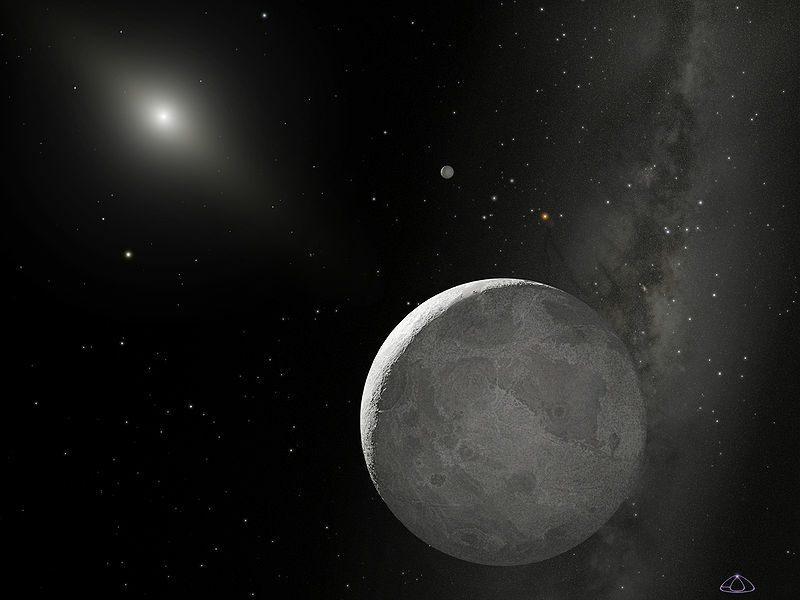 The illustration shows an artist’s conception of the dwarf planet Eris and its tiny moon Dysnomia, the moon visible more or less above the central object. The source of light to the left is our sun seen from a far distance. The surface features of the planet are fictional—thus the object fits this blog quite well. Eris, also called UB313, travels on a highly tilted orbit in relation to the big bodies of the solar system. Eris has the distinction of being both the largest dwarf planet, thus larger than Pluto, and also the most distant orbiting object moving around the sun. Eris was discovered by Astronomer Mike Brown, of CalTech, in July of 2005. The planet is also known as Xena. She is the Warrior Princess from the television show of the same name. Reality and fiction do seem to blend more and more in our times. 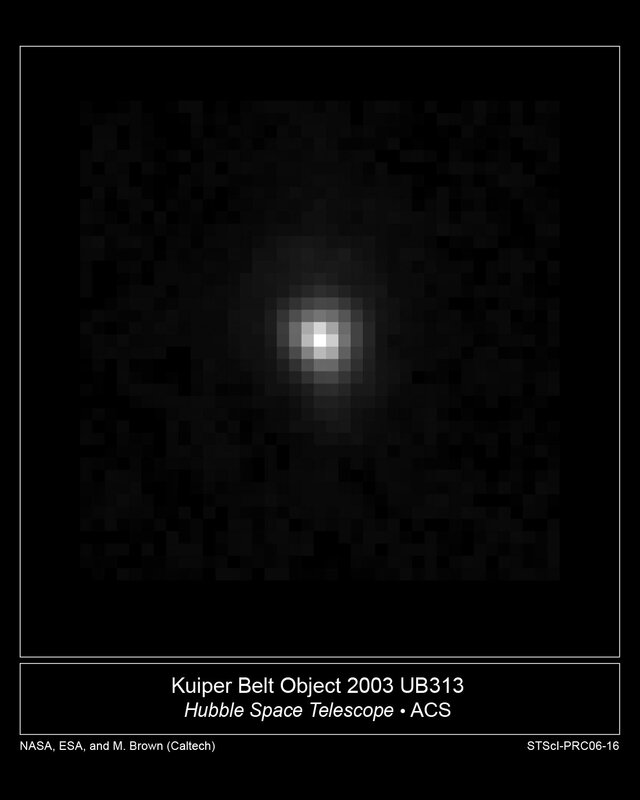 Returning to reality just briefly, the second image is an actual photograph of distant Xena-Eris taken by the Hubble. Picture credits are Wikipedia for the first image here and the Hubble Organization for the second here. In Alan Dean Foster’s 12-page horror story “Dark Blue” treasure hunter Chase Rontgen finds more than he bargained for in the sparse South Pacific far beyond Pitcairn Island, the last outpost of humanity. It’s a sharply written story with a nice twist at the end. The story is especially notable for some of Foster’s descriptions of the vast stretches of the South Pacific, hundreds of miles from the nearest land. The prospect of a sea story from Foster pushed me to pick up the collection High Seas Cthulu, since I always enjoyed the ocean world that Foster created for his 1980 novel Cachalot. So I thought it especially noteworthy that the stretch of Earth’s ocean we visit in this story seemed every bit as alien as the seas of the far-off planet in that world. Summary: This short, sharply written horror story is its own little horrifying treasure. “Dark Blue” by Alan Dean Foster is in the 2007 original anthology collection High Seas Cthulhu (Swashbuckling Adventure Meets the Mythos) from Elder Signs Press. When thinking about book reviews—well written reviews themselves being a pleasure to read—two sources come quickly to mind: The New York Times Sunday book review section [ 1 ] and Publishers Weekly book reviews [ 2 ]. Another source of reviews we like is online and called SF Site [ 3 ], a source for reviews on all things Science Fiction and Fantasy. Where do you like to read book reviews? Or, do you prefer book review podcasts? If you’d like to hear one of Arsen’s Science Fiction short stories read out loud and then reviewed—“Such is Fate”— a group in England did just that and the podcast is available here. [ 4 ] We rather like the name of this podcast series, A Bite of Stars, A Slug of Time, and Thou. We mentioned Reader’s Digest briefly in another post a while ago. Today (thanks to Brigitte Darnay) we came across Peter Applebome’s wonderful article on what that magazine had been and has become in the New York Times. It’s entitled “Reader’s Digest and Life in these United States,” and is available online here. You may have to be a subscriber to the paper, however, to access the story. In a way it is the story of Giant Planet—and what can happen to such bodies as time does its relentless work.